Justin Bieber is about to get roasted. 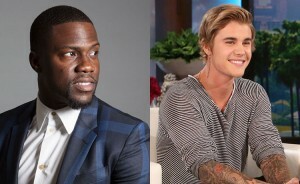 The Canadian heartthrob’s roast will be presented by Comedy Central and hosted by Kevin Hart on March 30. Comedy Central reps told The Hollywood Reporter the event will more or less be open season. “Everything is fair game — no holds barred/no strings attached,” they said. This past year Justin has been getting in trouble with the law (he was arrested multiple times) been on-off with Selena Gomez and overall been staying out the recording studio; there will be tons of jokes to choose from. Justin will join the likes of James Franco, Charlie Sheen, Donald Trump, Pamela Anderson and David Hasselhoff who have all been roasted. It is unknown which comedians will join in on the roasting but we sure can’t wait to tune in.